Wood carving is one of the most satisfying endeavors a person can set out to do, but it does come with some challenges. Whether your making wood carved bears and eagles or other wildlife sculptures, your going to need to consider the safety aspect of carving in wood. It seems as though everyone has there favorite gear, mostly because there is a lot of personal preference in terms of comfort and function based on specific applications. It doesn’t really matter whether your a hobbyist or a seasoned carver, the safety gear is still essential. I do a lot of my carving outside with a constant supply of fresh air. This eliminates the need for a dust collection system, but not a dust mask. Some wood species in particular are actually dangerous to inhale, and yet others have varying degrees of irritation to your skin, and or respiratory system. So, do your research and make sure you understand the risks of the wood your working with. Dust masks require a good fit and of the three types of gear discussed, this one requires the most research and attention to both the application and the functionality. You need to choose a mask that goes with the gear your frequently wear with it… glasses, ear protection and mask need to work and fit well together, especially if your going to be wearing them for any length of time. Next on the list is good hearing protection, no-one wants to go deaf, or loose any element of their hearing, so with that said, be smart and always wear ear protection. Some common choices are; ear plugs, over the ear muffs, and then you have special sorts, like noise canceling, bluetooth, and am/fm radios. I actually have a pair that allows me to talk with a noise canceling boom mic so I can talk hands-free without having to take off all my head gear. I’d suggest having a few types around, both for convenience and for variety… sometimes you may want to choose one over the other for the task at hand. Choose first for protection, then comfort. 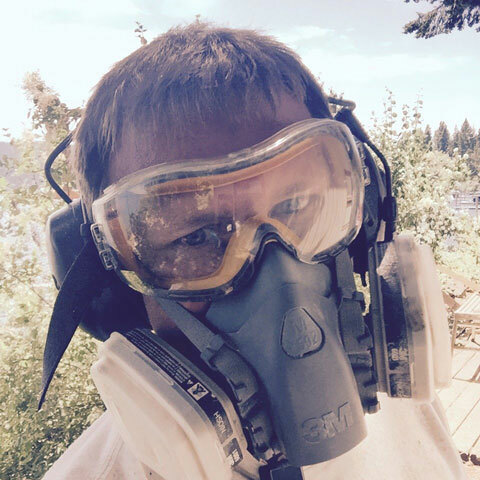 Finally eye protection… Sometimes while I’m carving the wind is strong, and it can cause chips and dust to make their way around my eye protection and really cause havoc. For these circumstances I wear goggles which are sealed around my eyes so that no matter what my eyes are protected. Yes they are bulky, but necessary in those situations. My everyday pair of safety glasses are made of glass, 95% of the safety glasses out there on the market are plastic. The advantage I’ve found with glass is that they stay clear longer, since they are very difficult to scratch compared to plastic types. One pair does cost about 50.00 (as of 2017) and other plastic types range 10-15.00 per pair.I also like to have numerous pairs of these as well, you need them to be very handy when you need them so that your less likely to disregard their use. I have both clear, and tinted pairs, but really dislike anything that doesn’t allow me to see my artwork as your plain eye would see it.